"I had no set game plan. I just wanted to run as strong as I could until I couldn't anymore. I'm just ecstatic." 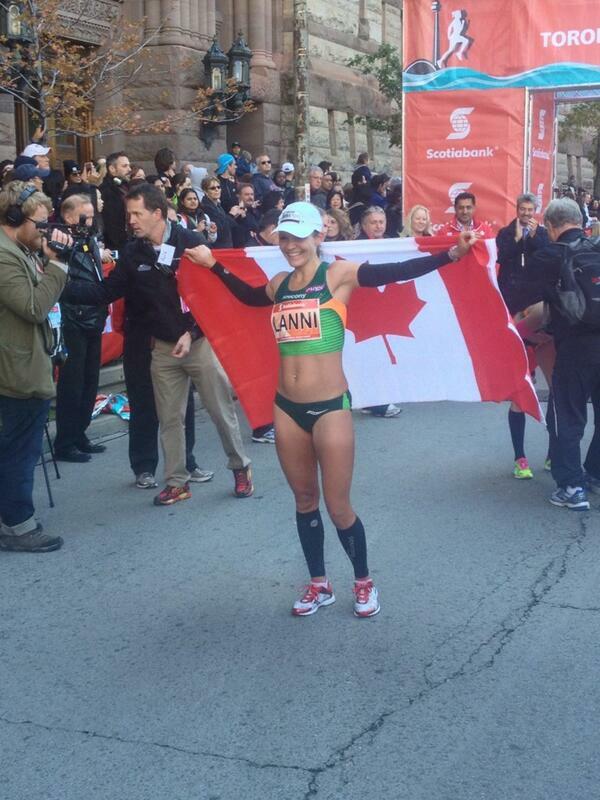 - Lanni Marchant after setting the new Canadian women's national record of 2:28:00 in Toronto. Her previous PR was just 2:31:51 and she ran 3:01:54 in Moscow. Does being a Kip or a Gebr make you faster? Could Lebron James Break 5 in the Mile? 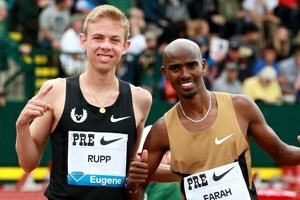 What if Alberto Salazar found Alan Webb as a HS freshman, before Raczko?? LRC Lanni Marchant Sets New Canadian National Record In Women's Marathon - Runs 2:28:00 In Toronto Deressa Chimsa of Ethiopia has set a new Canadian soil record of 2:07:05. CBC: Canadian Records Toppled At Toronto Marathon Eric Gillis ran 2:11:49 and came up short in his bid for the Canadian men's record. Amsterdam: 3-Peat: Wilson Chebet Wins Amsterdam For Third Ttime, Breaks His Own Course Record With 2:05:36 Valentine Kipketer won the women's title in 2:23:02 as American Serena Burla was second in a new PR of 2:28:01. Beijing: Tadese Tola Breaks 27-Year-Old Beijing Marathon Course Record With 2:07:16 Sprint Finish Win (link fixed) Zhang Yingying won the women's title in 2:31:19. Birmingham: Uganda's Thomas Ayeko Wins BUPA Great Birmingham Run Half Marathon In 1:02:32 As GB's Chris Thompson Was 2nd (1:03:03) And Abdi Abdirahman 3rd (1:03:08) Aussie Collis Birmingham was 4th (1:03:44) and Olympic 10,000 bronze medalist Tariku Bekele was way back in 5th (1:04:36). GB's Gemma Steel broke her own CR to win in 1:10:19. Detroit: 22-Year-Old Former Michigan Runner Zachary Ornelas Wins In 2:20 He's got a 14:12 5,000 PR. Kenya: 2012 Berlin Marathon 5th Placer Agnes Jepkosgei Wins Kimbilio Marathon In 2:49 Alfred Kipsane won the men's race in 2:16. Very Interesting Question: Toni Reavis Asks Does Competition Help Or Hurt Marathon WR Attempt? Comparing Chicago to Berlin, Reavis thinks that the competition in Chicago between Dennis Kimetto and Emmanuel Mutai actually hurt Kimetto's final time and his chance at a WR. RunnersTribe's Len Johnson Asks Why Australian Men Aren't Running Faster In The Marathon It's been almost 10 years since an Aussie man ran sub-2:10. Man Knits 12-Foot Scarf While Running Kansas City Marathon He ran 5:48:27 and his scarf measured at 12 feet, 1 3/4 inches. South Africa Has Their Own Star In 17-Year-Old Phenom Gena Lofstrand, Who Won Both The 800 And 1,500 National Titles This Year She PRed by 10 seconds in one year to run 2:03 and credits a lot of her improvement to spending a lot of time on a stationary bike in an altitude chamber. Lolo Jones Still Trying Desperately To Win An Olympic Medal And Will Get Another Chance If She Can Make US Bobsled Olympic Team At October 25th Trials Colorado Springs Gazette: "This quest for a medal, any medal, has defined her life for a decade." After Missing Moscow 2013 With Injury, HJer Blanka Vlasic Doing Intensive Physical Therapy In Ireland And Hopes To Be Healthy Again For 2014 World Indoor Champs "You don't know how much you miss it until it's taken away from you, but I think that we all need to be taken away from the things we love the most and we are, usually, at some point. You learn how to appreciate it more." Not Directly Running-Related But Interesting: Tribute To Recently Passed 87-Year-Old Japanese "Marathon Monk" Yusai Sakai Sakai is famous for being one of only one of three men to complete the Sennichi Kaihogyo twice. The Senichi Kailhogyo is a seven-year "quest for enlightenment" that by the end has the monks walking 51 miles a day for 100 days on barely any sleep. Desire By Some To Race Under A Fake Name Or Anonymously At Odds With Increased Security At Road Races Some are worried about privacy while others just want to run as Bruce Wayne, "Hugh Jass" or Kermit Frog. Former Head Of Jamaican Anti-Doping Renee Anne Shirley Throws Out More Accusations Against The Organization, Claiming They've "Never Carried Out A Blood Test" She claims they received 30 blood testing kits, but never used them and also says that she thinks Veronica Campbell-Brown's positive test for a diuretic should have resulted in a 2-year ban. LRC Week That Was: Dennis Kimetto, Rita Jeptoo And All Things Chicago Marathon, Kim Smith, Stephen Sambu Pick Up $100k, Haile Gebrselassie Still Has It We look at just how good Kimetto's and Jeptoo's Chicago performances were, explain why we're not crazy about the BAA Distance Medley's gimmicky prize money structure and remind you that even at 40 years old, Geb is still very, very good. Study Finds That You Can Actually Talk Yourself Out of Exhaustion By talking to yourself during exercise, you can actually reduce perceived exertion and boost performance. Does Pregnancy Give Women An Athletic Performance Boost? Studies have found that pregancy results in increased blood flow and oxygen-carrying capacity, as well as increased levels of growth hormone, which can lead to performance boosts six to 12 months after pregnancy. *What are the US men missing in marathon training???? A lot of discussion. *Kimetto 150 mpw. Ritz 110 mpw, once 120 mpw. LRC Dennis Kimetto Wins, Shatters Course Record With 2:03:45 Clocking Wow, what a race! 61:52 for the first half, 61:53 for the second half. Dennis Kimetto put on a show and staked his claim to being the #1 marathoner on the planet as he beat Emmanuel Mutai, who became the first man to break 2:04 and lose on a loop course. Americans Ritz and Teg didn't get what they wanted. Analysis: Eight Quick Takes On The Men's Race: Kimetto Is A Stud, Mutai Is Mr. Silver, Teg & Ritz Struggle Final 10k, Abshero Goes For It We've got a lot to say about this great race, so it appears in a separate piece. LRC Rita Jeptoo Wins, Sets World-Leading 2:19:57 Time By Running A Big Negative Split (updated with quick takes) Jeptoo lost in agonizing fashion last year in a sprint. This year, she left no doubt as she crushed the second half (68:42) to become the first person under 2:20 in 2013. Her final 12.2 k was simply unreal, as she did her best Paula Radcliffe impersonation and ran faster for her final 12.2k than both Ritz and Teg. *What are the US men missing in marathon training???? *No US guys currently within a mile of the best Marathoners. Sad. 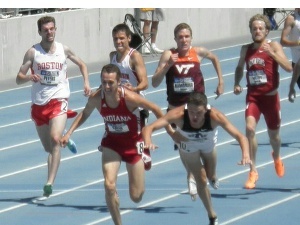 *Was Ritz crying in his flotrack interview? *Kawauchi ran 2:11:40 today in 8th marathon of '13. Will Tegenkamp beat his time? Friday: LRC Will The Race Go Out In 61:45 And How Will Dathan Ritzenhein React? (link fixed) With good weather in the forecast, the leading Africans may want to go out more than a minute faster than Ritz wants. Will they be slowed to please Ritz or will he have to solo it alone? Also, Emmanuel Mutai reveals he's healthy and Moses Mosop is going to be tough to beat. 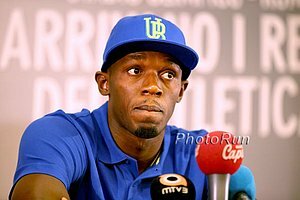 Thursday: LRC 5 Takeaways From Thursday's Presser: Mosop Is Healthy And Fit, Tadese Is Ready For Another Crack At 26.2, Kimetto And Abshero Are Confident, And Kogo Hopes He's Ready For Uncharted Territory We broke down the race earlier for you on you on paper, but you never know what really to expect until you get the inside scoop on-site. We've got it and you can as well if you read our piece. Plus was there a fix at the 2012 Berlin Marathon? More Chicago Men's Pre-Race Coverage: LRC Teg Does The Marathon: Matt Tegenkamp Shares His Thoughts Ahead Of His Highly-Anticipated Marathon Debut Teg is full of confidence: "I feel so much more comfortable on the roads than I do the track, and I never thought I'd say that." If You Read One Thing All Month, This Should Be It: Inspiring Story On US's Stephanie Pezzullo: Running For Her Life The Charlotte Observer's Théoden Janes has written a masterpiece after Pezzulo opened up to him about her struggles in life. A tough upbringing with a bipolar dad who allegedly sexually abused her led to crushing anxiety and even a suicide attempt. She was saved by sports (first soccer, now running) and faith. *Excellent Recommended Read: One Of The Good Guys In The Sport Team Eugene's Craig Leon Hoping For 2:11-12 In Chicago We enjoyed meeting Leon in Boston and Curtis Anderson has written an excellent profile on Leon, who works a job and has "never had a bad marathon" according to coach Ian Dobson. Giro di Trentoe 10k: Edward Soi Wins Thrilling Sprint Finish Over Wilson Kiprop And Imane Merga The finish was tight as the winning time was just 29:01. Eindhoven Marathon: 14-Year Kenyan Win Streak Halted As Ethiopia's Yemane Tsegay Adhane Wins In 2:09:41 IAAF Heavy rain made all the talk of a new course record (2:05:46) a moot point. Ruth Wanjiru won the women's race in 2:34:48. *Coach James Li Says Lawi Lalang Raced Yesterday After Only 2 Weeks Of Training Li: "Lawi isn't happy with his race today but I am reasonably happy. He's only trained for two weeks and he still ran five miles at 4:45 pace so that is pretty remarkable." Men's Results: 2013 Pre-Nats Men's Results - Colorado And Kennedy Kithuka Win Kithuka dominated but the battle for third between Edward Cheserek and Chris O'Hare was tight. Women's Results: Georgetown And Emma Bates Win #5 Georgetown upset #2 FSU as three different people led in the finishing straight. French IOC Member Says France Needs To Show "Humility" Instead Of "Arrogance" If They Want A Shot At Winning 2024 Olympic Bid Paris has had five consecutive unsuccessful bids. Yohan Blake's Agent Cubie Seegobin Warns Jamaican Athletes They Could Lose Respect If The Public Isn't Educated About Doping "Do people even understand what it's all about? You hear that [Powell and Simpson] are doping and trying to cheat, but on the face value the substance that apparently was found in their bodies (oxilofrine) can be taken legally when they are not competing, but no one has taken the time to explain that and give perspective. Instead, everyone just assumes that they are cheating without the facts." Researchers At The University Of British Columbia Develop New DNA Test To Catch Blood Dopers However, the test seems to have a lot of limitations and will probably not be used. 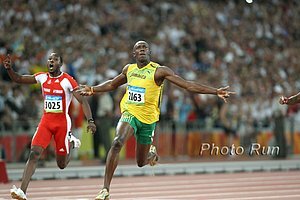 Good 14-Minute Highlight Video From Usain Bolt's BBC Radio 5 Live Interview Bolt said straight out that Yohan Blake wasn't even in his league back in 2011 when Bolt false started in Daegu and Blake was World Champ. He also talks about this year's doping issues and the lack of testing done by JADCO. World HJ Champ Bohdan Bondarenko Reflects On His Breakthrough Season "My life has changed. I now feel that more attention is given to me." A Nike-Backed Group Led By Vin Lananna Is Planning A Portland Bid For The 2016 World Indoor Track & Field Championships A source said that Lananna would make a presentation to the IAAF on November 15th. The US has never hosted a World Outdoor Championships and only once a World Indoor Championships in Indianapolis in 1987. *The Telegraph: Birmingham's bid to host 2016 World Indoor Championships faces new threat from Portland OR Birmingham hosted the event in 2003. Mo Farah Making TV Appearance With Britney Spears They will both appear on UK comedian Alan Carr's Chatty Man show. Alberto Salazar Shares With Outside Magazine His "10 Golden Running Rules" Number 4 on the list is, "Stay On The Trail - Pavement damages joints, tendons, ligaments, and muscles. The more you can run on grass, wood chips, or dirt, the better off you are. My athletes run 90 percent of their workouts on soft surfaces." Caster Semenya Looks Ahead To 2014 After A Disappointing Year Semenya: "It was a rough year for me. ... But I am a big girl what can I say? ... There is not much I can say about 2013 because I got nothing much out of it." We Can't Wait For The Minimum 4-Year Ban To Kick In: 2:28 Chinese Woman Marathoner Sun Juan Gets 2-Year Ban After Testing Positive For Testosterone Her coach was also banned for 2 years. 1,500 Runner Lisa Dobriskey Feels That UKA Decision To Only Give Funding To Athletes Who Are Considered "Medal Contenders" For 2016 Is Flawed Her first point is a good one, as she says, "I think it is very difficult to predict medallists for 2016 and 2017. If you look back to some of the medallists at the Olympics last year, they wouldn't necessarily have been predicted medallists three years out." Mo Farah did not look like a double Olympic Champion back in 2009. Yelena Isinbayeva: "People say pole vaulters have beautiful bodies. I don't mind." Eleven Olympians Headline NYRR Dash To The Finish Line 5-K The Day Before The NYC Marathon Men's field includes Nick Willis, Evan Jager, Lopez Lomong, Chris Solinsky, Ryan Hill, German Fernandez, Ben True, Will Leer, Sam Chalenga, Chris Derrick, David Torrence and Donn Cabral. Women are lead by Shalane Flanagan, Sally Kipyego, Emily Infeld, Lisa Uhl, Betsy Saina, Molly Huddle and Kim Conley. Mo Farah Talks To The Guardian About A Run-In He Had With Craig Mottram, Getting Tired Of Always Having To Do The "Mobot" For People In The UK, And How He Hates The Daily Mail He calls The Daily Mail liars and talks about how they went to Somalia and tried to pay his brother to sell them his story. Very Deep Fields Set For Next Weekend's Frankfurt Marathon As 21 Men Have A PR Sub-2:10 And 5 Are Sub-2:05:30; Also 5 Sub-2:25 Women The men's field is led by 2:04 Ethiopians Dino Sefir (2:04:50) and Feyisa Lilesa (2:04:52), while Ethiopia's Dubai Marathon champ Tirfi Tsegaye (2:21:19) leads women's field that has former Boston champ Caroline Kiel and a debut from World XC medalist Gelete Burka. You Hear That, Competitor? Even Kenyan Marathons Can Afford Appearance Fees: Kass Marathon Giving Appearance Fees To Sub-2:10 Marathoners Sub-2:10 guys will get about $6,000 each. Alexi Pappas: 5 Things You Should Know About Me Pappas talks about not running her junior or senior years of high school and about her many interests outside of running, including filmmaking. She's also doing the NYRR 5k Dash To The Finish. RRW: Sam Chelanga Looking Ahead After Solid B.A.A. Half Marathon Performance, Where He Was 4th In 1:01:04 In August, he moved to NH to train with and be coached by Mark Coogan and says he is "finally feeling good" in his training again and looking forward to making his marathon debut next fall. Artist Inspired By Running 11 Miles With Paula Radcliffe During The 2002 Chicago Marathon Paints Portrait Of Her The painting is called "Paula Radcliffe Flying Through Time." He's done paintings of other top distance runners such as Haile G and Steve Prefontaine. View gallery here. Mo Farah Downplays Suggestions That He Could Break 2-Hours In The Marathon, Saying That's "Crazy" He said, "I don't think two hours is going to be broken in the next 10 years or even beyond that, maybe even 100 years ... The rumours actually started because my sponsor are working on a shoe called 'Sub Two-Hour.' They keep working on that, and that's how the rumours started. I never actually said it." *Farah Unlikely To Do Glasgow 2014 Commonwealth Games As He Focuses On The London Marathon He said, "Glasgow is a bonus if I do it but it is not on my list." Good Read: Jenny Simpson Talks To The IAAF About Her Career And The Race That First Made Her Realize She Had A Future Outside The Steeplechase She set the collegiate 1,500 record at 3:59.90 in 2009 at Pre Classic and says, "My effort at Pre was a paradigm shift for my career in several ways. ... I'd thought of myself as a steeplechaser with a future in the 5,000m and 10,000m but after that race, there just seemed to be less limitations and more possibilities for my future in the sport." Janet Bawcom Feeling In Good Shape Ahead Of NYC Marathon After Winning Monday's Tufts Health Plan 10K In 32:28 NYC will be her first full marathon since the 2012 Olympic Trials. Usain Bolt's Coach Glen Mills Defends Jamaican Anti-Doping Saying that They've Been Unfairly Targeted Because Of Their Success He said, "Nobody wants to see their dominance of sprinting continue" and that the media has been "sensationalising" the issue. Jamaica Anti-Doping Programme Set To Be Investigated By WADA This investigation is in response to allegations made by former JADCO director Renee Anne Shirley. WADA is unhappy, though, that the visit will not happen until 2014. LRC With An Assist From Meseret Defar, Sentayehu Ejigu Sets Course Record At Tufts Health Plan 10-K For Women, Emily Infeld Second Sentayehu Ejigu of Ethiopia was encouraged to run this race by Meseret Defar and she left breaking the 25-year-old course record of Anne Hannam. Emily Infeld's strong 2013 continued with a second-place finish. Janet Bawcom was fourth and led Team USA Arizona to the $10,000 team title over Boulder Running Company/Adidas. More: Chicago Tribune From 1996 On Anne Hannam: Running On Empty: "In that magical summer and fall of 1988, Anne Hannam ran nine road races from Alaska to Massachusetts, won all nine and set seven course records. She also weighed 96 pounds and was starving herself slowly ..."
LRC Forums: Whatever Happened to Anne Hannam? LRC WTW: Zola Budd, Running Models, Veronica Campbell-Brown, Twin Cities Past And Present, Guelph, And Bad College Sports Publicity This week we praise college XC winners old (Zola Budd) and young (Alexa Efraimson), talk about the juggernauts of Canadian collegiate XC, talk about Twin Cities winners past and present, and tell the Yale and Lousiville Sports Info departments that our sport deserves better. Since we had to be a little shorter than normal to get ready for Chicago, we leave you with photo album full of Oiselle models, including Kate Grace and Lauren Fleshman. Recommended Read: Great Q&A With Annie Bersagel The former Fullbright scholar just PRed by 13 minutes to win the US Marathon Champs in 2:31. Not bad for a woman who just got out of Stanford law school and works a full-time job. Former 200-400 Sprint Star Marie-Jose Perec Is Running New York City Marathon Next Month At Age 45 She won Olympic gold in 1992 and two more in 1996. Alexa Efraimson Reinstated On Appeal After Initially Being Declared Ineligible For High School Competition She was originally declared ineligible for running the Bill Dellinger Invitational, where she raced unattached and won the race against an elite collegiate field. This broke a state rule saying high schoolers can't compete "against a college team" but the decision was overturned on appeal. RIP: Dog Who Recently Bandited A Half Marathon Dies Of A Heart Attack The dog got free from his owners and ran the half marathon in 2:15, even receiving a finisher's medal. Study Finds That Only 12.2% Of Women 50 And Older Are Happy With Their Body Size Those that are happy are highly active. After Becoming The Fastest Loser In History At 2:03:52, Emmanuel Mutai Says He's Sick Of Being The "Eternal Bridesmaid" He has the extraordinary record of finishing second at major marathons on seven separate occasions in five years. After His 2:03:45 In Chicago, Dennis Kimetto Says He Wants To Go After The WR Next Year In Berlin He'll run Boston in the spring and then Berlin next fall. Autopsy Reveals Kenyan Marathoner Died Of "Pulmonary Failure Due To Hemorrhagic Congestion"
Trailer For New Documentary On Steve Prefontaine Called "Pre's People" The documentary is the first to center around Pre's life in his hometown, Coos Bay, Oregon and is shown "through the eyes of his fans." Groninge Netherlands: Viola Kibiwot Sets Worlds Best For 4 Miles As Haile Gebrselassie Nearly Beats Yenew Alamirew 19:14 for 4 miles for Kibiwot as Emily Chebet ran 19:17 to break the old record as well. Kevin Helliker Writes Follow-Up Column In WSJ After Receiving Backlash From The "Slowest Generation" The 20- and 30-somethings have responded with excuses for why they are slow, including "The economy is so bad, we can't help it." *MB Discussion: Obama/economy to blame for slowing of running times across country?